Scientists from the University of Southampton have used an innovative optical mapping technique to help reduce the risk to towns and cities from geological hazards, such as landslides. The researchers, working with colleagues in New Zealand, used a technique called Light Detection and Ranging technology (LIDAR) to identify and accurately measure changes in coastal features following a catastrophic series of landslides that occurred in New Zealand in 2005. “Our findings are important for assessing geological hazards and reducing the dangers to human settlements,” said Professor Jon Bull of the University’s School of Ocean and Earth Science based at the National Oceanography Centre, Southampton. “LIDAR uses the time taken for reflected light to return from objects or surfaces to determine the range, in a similar manner to radar. It can be used to monitor coastal evolution, and to identify and precisely measure landform changes resulting from geological events such as landslides,” explains University PhD student Helen Miller, who worked on the research project. Information was collected from the small coastal town of Matata, located on the Bay of Plenty at the northern end of New Zealand’s North Island, which was struck by devastating debris flows on 18 May 2005. The debris flows were liquefied landslides of water-saturated material including boulders, logs and other debris that swept away cars and even whole buildings, although fortunately no-one was killed. They resulted from torrential rain that triggered widespread landslips in the catchments of the Awatarariki and Waitepuru streams in the steeply rising hills behind the town. The material eventually spilt out along the coast where it was deposited to form a large fan-like sediment deposit. To help understand the complex pattern of sediment deposition, the researchers compared information obtained before and after the 2005 event. 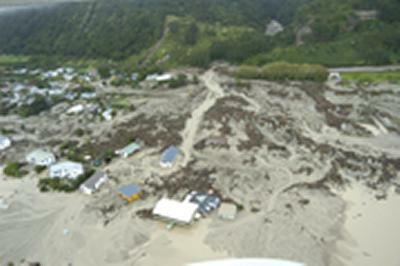 Based on LIDAR, eye-witness accounts, field investigations and aerial photographic surveys, the researchers estimate that debris flows from the Awatarariki stream transported at least 350,000 cubic metres of debris. The researchers were able to map the sediment flow paths, along with changes caused by the clear-up operation and the creation of man-made levees after the event. Their observations show that the final shape of the debris fan, as well as spatial differences in make-up and consistency, were largely influenced by existing physical features such as sand dunes.